It's March and that reminds me that many folks are off Island, some to sunny warm climes, some for more sedentary yet necessary reasons. It is a quiet time there. This is the time of year for Spring Break, even on the Island. So it seems appropriate to take a look at some folks on an adventure earlier this Winter. Whether it's a cloudy day or sunny, the birds are out and about at Ding Darling, a US Fish and Wildlife Refuge on Sanibel Island in Florida. This place can be loaded with wildlife. Even some of the birds were visitors. So those who love such creatures were also there. It was no surprise that a birder or two with Island connections turned up there. Birder Melody was in her element. Her life list was quite improved by the end of her trip south. Ding Darling was merely one stop on her quest. Lew was just concentrating on developing camera skills. Friend Jill was a wealth of information as the two women found and identified bird after bird. What photos! Such concentration! Such a great day! Rain? Well, it threatened but held off the downpours until later in the day. By the way, if you see Melody, congratulate her. She broke into the top 100 e-birders in Florida by identifying, reporting, and photographing 159 species! I was lucky to capture this little one - a Willet I think - at Bunche Beach. After following Melody and Jill around, I do think they are bird whisperers. Along the way this Winter, Kathleen Dixon shared some of her views. Her photos are always fun to see, too! On the Island, Spring- that is, March - looks different. March means buckets hanging from Maples all over the Island. Lew found them right on Main Road when he was there last week. Door County Naturalist Roy Lukes says the tapping of the Sugar Maples leads to one of nature’s finest natural resources. Yup, a change in the weather is happening on the Island. 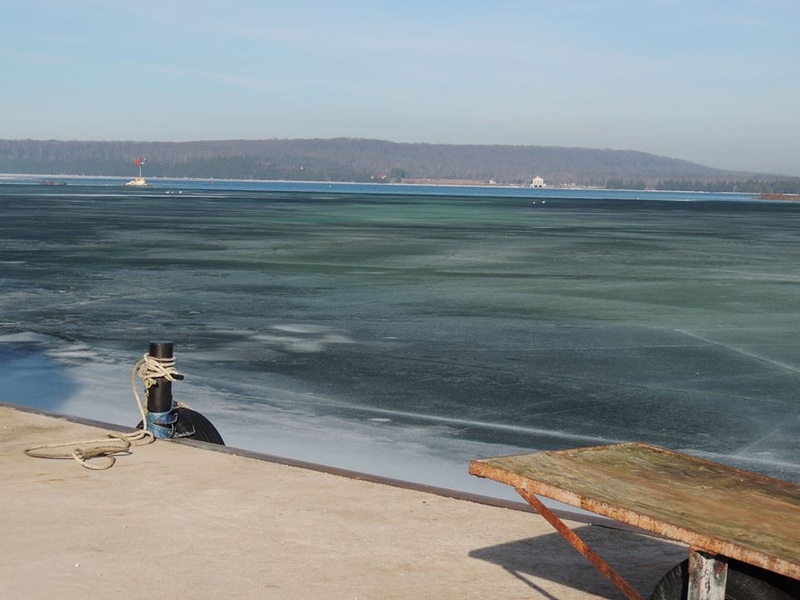 Melody reports the ice is looking black in Jackson Harbor! This photo was taken today and the temperature was 46 degrees. I wonder if/when the See Diver will move back there from the ferry dock.